Identification: 10-20 mm, narrow waist, distinctive banding in yellow and black, two pairs of membranous wings. Origin: common throughout the uk and Europe. Behaviour: a social insect with classes and order-the sterile females are the workers and others take on many responsibilities in the colony. Breeding: queen emerges from hibernation in mid –April, constructs 10-20 chambers and lays eggs in each one. Sterile female workers hatch and by late summer the colony reaches 3,000 to 30,000 individuals. Males and new queens are produced in late summer, males mate with the new queens and then die. 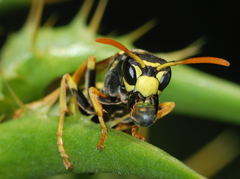 The Queen wasps in turn fly off to find a winter hibernation site usually inside buildings or hollow trees.